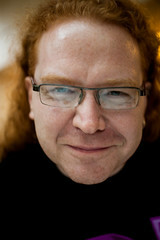 This is a guest article by Christian Heilmann1 on why speaking at a BarCamp really isn’t that complicated. It has been reproduced here with permission. He’s been nominated standards champion of the year 2008 by .net magazine in the UK and currently sports the fashionable job title “International Developer Evangelist” spending his time going from conference to conference and university to university to speak and train people on systems provided by Yahoo and other web companies that want to make this web thing work well for everybody. I thought this was a very useful article, particularly for people who have no experience of speaking in public. I particularly like your advice to talk about something you are very knowledgeable about (and/or are passionate about). Because nerves often take over when you’re in front of a group (and perhaps a group of your peers are more daunting) doing this will reduce the likelihood to go into a blind panic when someone asks you a question on your chosen subject! I also think it’s a great idea to host a discussion or pick a problem and ask the group to help you solve it. As you mention, geeks love problem solving – and it’s a brilliant way to encourage interaction and collaboration in the room. Gets the energy up, though I doubt that will be missing at BarCamp! - concentrate on the people out there in the room and make eye contact with one or two of them, especially if they seem interested in your topic – this will help you not feel so self-conscious & calm your nerves. Enjoying your subject matter is really important, as it’s usually rather infectious:-) So have fun! Making sure you know all about African Mangoo shared with you. Substantially, this publish is truly the sweetest on this notable theme. I harmonise along along with your conclusions and will thirstily seem ahead inside your incoming updates. Stating thanks will not likely just be ample, for that phenomenal clarity with your writing. I will right grab your rss feed to stay informed of any updates. Admirable operate and considerably accomplishment with your enterprise dealings! Please excuse my poor English as it is not my quite first tongue.